Amazingly, but these days, when the whole new world is just a few mouse-clicks away from you, you do not need anything except for genuine enthusiasm and a little money to start a business. You do not need to accumulate great capital or do an MBA degree to become remarkably successful. You do not need some special connections. Specifically, you do not need anything to start a profitable business online. Though it might seem too complicated to some of us, starting an online store with throngs of people willing to buy your product has become a reality. And the only thing you need right now is a guide introducing you to the language of e-Commerce so that you could swell the ranks of prosperous online entrepreneurs. So, here’s your practical guide to staring a business site, which contains comprehensive step-by-step instructions and directions, and by the end of this article you’ll have all the knowledge at your fingertips to open the first site. The first question to answer is what type of an e-Commerce store you want to open. Of course, you may have already came up with a few ideas that seem easy on the eye, but are you 100% that these products could make out of your e-Commerce store a selling bomb and start off with success? There are a whole lot of things in the online market. Only a handful of them turn into a selling trend. So the best practice to open an online store is to do some research first, even before starting. But fear not, because we’ve prepared a few interesting bits with huge potential for you. According to an estimate, the most popular e-Commerce businesses are those that sell clothing. The trending niche products include branded apparel, t-shirts with prints on demand, denim, women’s fashion, baby clothes, maternity wear, shoes, shapewear bodysuits. Another despite-anything popular market is car accessories, so your online store may offer steering wheel covers, organizers, air fresheners. Health and fitness products have always been steady online, at least over the last couple of years, so consider selling prepared diet meals, green tea, detox products. Among others are electronics, online books (self-development and psychology are quite popular), pet food, handmade gifts, furniture, mobile accessories, dog toys, building materials. If you are still in the process of making a final decision what to start from, then Google Trends tool may come in handy to sort this pile of business trends out. NOTE: returns, refunds and exchanges come along with fashion stores – about 50% of your production runs the risk to be returned. It stands to reason because clothing may have sizes or colors different from the photos you display online, so your customers might want to exchange or return some products. That’s why it’s crucial to get your photos and descriptions together so that any visual representation would match products from the store. In summary, a USP is your product plus idea. Every business has that ‘something’ that distinguishes it from others. This distinguishing factor is called a Unique Selling Proposition. You might ask: why do I even need this USP when starting my business? Well, there exist about one hundred thousand e-Commerce sites online, and your store is going to be just one of these business heaps. Following the trends makes your store popular, but your product makes you sales. That’s why you have to open an online store that serves a strong USP. What is my general business idea? Open the rusty bolt of imagination, brainstorm. Take down everything and then sort ideas out. What is my product? It is impossible to make money with unpopular products, bear this in mind. Again, browse Google Trends to find out what takes up the majority of searches. How do I integrate the business idea into my product? Right after you have your business idea and your product, don’t forget to merge these terms and see if they fit one another or not. Who is my buyer persona? A best business practice is to define a target audience so that you adjust your USP to market demand. Who are my competitors? You’re not the one and the only, so in any case you will have to face a certain amount of competition online, even though your USP is the one and the only. Find ways to beat the competitors. What problem does my product solve? Finally, consider problems consumers may have. All they do is looking for some answers in your store. Your USP is not some ‘nice to have’, it is ‘must have’. If a decade ago we could hardly imagine having hands-on systems allowing to open a store in cyberspace, nowadays we’re offered a way too many business options to start with. So when you’re ready to launch the USP, you have all the right design and the branding seems perfect, it’s time to make these blueprints a reality and open a store. Thankfully you won’t have to delve in programming, drill CSS skills or take online courses on web-designing – there are special business platforms with welcoming interface that allows to start a store’s site in a few minutes. Literally. Basically, e-Commerce platforms represent a software solution allowing you to set up everything without coding. They enable a business to manage a store’s site from the front-end to the back-end. On the whole, e-Commerce solutions include customizable themes and plugins, inventory management, CRM and much more. One of the oldest e-Commerce platforms, established since 2004. That is a home to more than two hundred thousand small businesses. Shopify offers a 14-day trial period, so you have a chance to test this online system before paying your dime. You’ll find hundreds of applications, built-in addons to customize your site-commerce, not to mention thousands of business themes coming from great web designers. Perfect for those who don’t have any development skills and much time to open an e-Commerce store. Another SAAS e-Commerce solution meaning you don’t have to own any software to open an e-Commerce store – it comes to you as a service for an affordable monthly fee. BigCommerce offers a wide range of customizable stuff to design the site easily, so the platform aims at people without lots in the way of web skills. Tech-savvy entrepreneurs will find plenty of opportunities to work with the source code, too. Perfect for those who appreciate a dollop of customizable things. This is a versatile e-Commerce platform suitable for advanced web, mobile and application development. Weex provides a built-in editor where you can write and test your code, so the huge advantage of the e-Commerce platform is that users don’t have to download anything. Perfect for those who want to make it intricate and advanced from the start. Mostly a hosting service, but it’s oriented for online shopping sites. Weebly gets somewhere in the middle between Weex and Squarespace – not so flexible, but not so sophisticated. Even though Weebly has limited customization, it’s easy to start here thanks to useful e-Commerce features to expand your business. Perfect for those who wants a simple, but highly functional developing environment. If you need big-time designing, Squarespace is your final destination. Just for the record, Keanu Reeves’ Arch Motorcycle business site uses Squarespace as a builder, so no one questions reliability, usability and reputation of this great e-Commerce platform. Squarespace puts everything in one go, but a little bit of effort would be nice. Perfect for those who have a couple of hours to understand the back system. Starting an online store always means amassing lots of digital content, especially when it comes to one-to-one marketing and you have to deal with advertising. 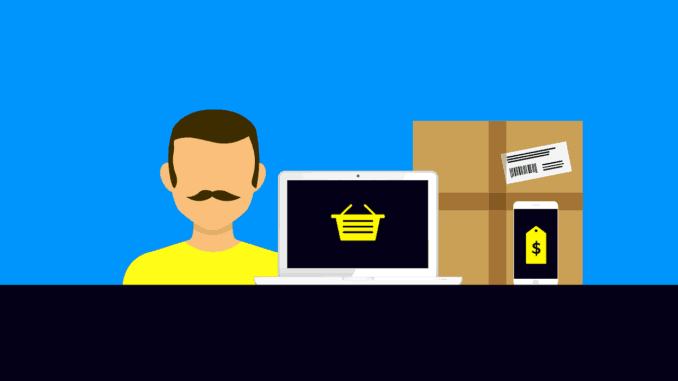 Having an e-Commerce builder is just creating a platform where you can display products. Now you have to learn how to manage these products and structure all the data at your site. If you want to learn more about CMS and how it works, find beginner’s guides online and get to know every aspect of managing your content. Now we can start off. Here you’ll find a step-by-step instruction that will help you transform your ‘word-based’ online store into a real e-Commerce site. A few mouse clicks, a couple of bucks, a little patience and your business will be officially online and operating. Register a site’s domain name. It’s not difficult to find a decent site hosting for your business. Bluehost, HostGator, GoDaddy and a few more out there are among the most popular providers online. Don’t forget about some catchy brand name – something bright, something simple. Remember the rule. There’s the rule of thumb when it comes to hosting providers – three S’s. These are security, support and speed. Your business needs a fundament. Get your e-Commerce platform – site builder and CMS. As an alternative, you can build a site from scratch – find a proficient web developer to tackle the task. Decide how to receive payments. Yes, you haven’t earned a penny yet, but we’re all in here to make money. When your site layout is ready to go, you’ll need a merchant account to process credit cards. First-timers usually start off with Google Checkout or PayPal. Optimize the site. User-friendly interface is what you really need for your next step. For example, you can improve shopping cart experience and feedback services. Your customers should easily navigate through the site. Improve your ranks in search engines. One could probably write a three-volume novel about SEO, but there’s probably already one. If you have no faintest idea what ‘SEO’ stands for, save it for specialists. In short, get your keywords together for organic search. The thing you should understand above all this is that opening any online store needs as much effort as opening a local shop down the street. Starting online business is not some enjoyable voyage where you lean back and watch numbers grow automatically. You have to always source production for your business, look for suppliers, establish partnership with other stores, avoid scammers and keep the thing going like a Swiss watch. If you don’t have an opportunity to warehouse products, then focus on drop shipping. But the best idea for any online business is to start an e-Commerce site selling directly from a local store – in other words, you resell your own production, but online for a margin. Cash on delivery. That’s a common practice for developing online stores when ‘parcels’ are handed over to your customers by courier companies at the same time of payment. e-Wallets. The more, the better. Keep in mind that any country has its own popular e-Money system. Like, Canadians prefer Skrill or Neteller while Americans might want to use PayPal. Courier service. Two options – either ‘establish partnership’ with a delivery service like DHL or employ your own couriers. Business is impossible without customers. The more customers you attract to your store, the more sales you generate. And only if ‘Microsoft’ or ‘Google’ are featured in your brand’s name, there will be sales. Otherwise, you are nobody in the middle of a big dump called ‘the Internet’. Know your traffic, but, most importantly, know how to drive it ‘crazy’ in terms of numbers. SEO. The basic idea of search optimization is getting more traffic to your online store through content. Quality descriptions, trendy keywords, optimized images with alt tags, mobile optimization, even SSL certification have an impact on your popularity within search engines. SMM, SMO. Social media marketing and optimization work together. While you engage a broader community on your Facebook page, don’t forget to ask for shoutouts and cover as much space as you can. When it comes to SMM, even competing businesses can become besties and boost one another through posts with backlinks. Contextual advertising. Use Google Adwords, Yahoo Advertising, Bing Ads to pop up in a relevant search. Teaser advertising. Arouse curiosity, make people lose their heads in an attempt to solve the riddle of your store’s advertising campaign. Banners. Simple-annoying-irritating, but effective and suits every type of business. Affiliate programs. You help others sell their products, you get a commission. Or vice versa. If you don’t want to get tied to a sale, try CPA affiliate marketing. Instead of traditional affiliate programs, CPA one allows to start making money through clicks, not sales. Google My Business. This is your Google everything. Open an account there right now. Offline advertising. Suits to online-offline types of businesses. Consider the following situation: some customer chooses an item from your store, places on order online and then, all of a sudden, it turns out that you’ve just sold the last item of this category. Your customer gets angry, cancels the order, moves to another e-Commerce store and takes what he or she wants. And congratulations! You’ve lost a customer, money and a little bit of reputation because of being inconsistent. You could have avoided the problem if you’d integrated a smart e-Commerce system into your store allowing to keep tabs on the products and their availability from the very start. Do you really want to lose ready-to-buy customers? Then it’s time to go advanced and create production database, whether on paper or digitally. Update essential site information, always stay tuned. This is e-Commerce, not some summer camp. When it comes to site traffic, 99% of business gurus have only one thing to say: ‘improve’ store’s traffic. Not ‘drive traffic’, not ‘okay, now look at these ways to draw an audience’. The thing is that you’ve already driven some site traffic because you’re online – hundreds of people come across your e-Commerce store every minute, but does it actually count? You may have 1 million visitors in one day, but in the end you make only one single sale. So the most important aspect to start your business smoothly is to improve conversion or, in other words, converse your visitors into customers at the rocketing rate. And believe it or not, this is the most intricate part of any business. There are gazillions of tactical strategies, tips, schemes. You shouldn’t buy into all that and remain coherent. Analyze site traffic, change your online store accordingly – try out new shipping options, different payment systems – and catch the fish in this ocean of nothing. You’d rather have 100 active users regularly ordering something than 1 million onlookers passing by. Whether your e-Commerce store is convenient to use or not determines whether your customers are going to buy from you or not. Make the place comfortable: your content, interface, buttons, menus, cart experience should encourage people to linger for a while. The best way to improve usability is to hire pros. Don’t get greedy here. Bad user experience – floppy site design, non-informative pages or images, poor descriptions to store products, slow page speed may scare off customers and have a negative impact on your online business. Technical issues – a narrow range of payment systems, order confirmation that takes a long while, few items available in stock create a funnel of trouble. Poor customer services – no contact number, support agents online, chat boxes, few contact-us methods, long delivery to name a few can cause a large drop in sales. In spite of your best attempts in driving consumers, there might be zero customers at the virtual doors of your online store. No one knows for sure which products will be thriving, even top business persons. You make accurate assumptions when starting, nothing more. Your mistakes will be perpetuated online forever. Once you fail, it becomes the real public domain. Negative reviews, angry feedbacks, ‘armed conflicts’ are unfortunate companions of online businesses. Search optimization is great, but over-optimized context often gets penalized for being redundant. While you are falling down in the search ranks, your online popularity is doing the same. Yet you shouldn’t focus on risks. Always keep growing your online business, even if you seem to have a successful site bringing much revenue. There’s never a threshold to pass when it comes to moneymaking. And remember – every big journey starts with a small step.